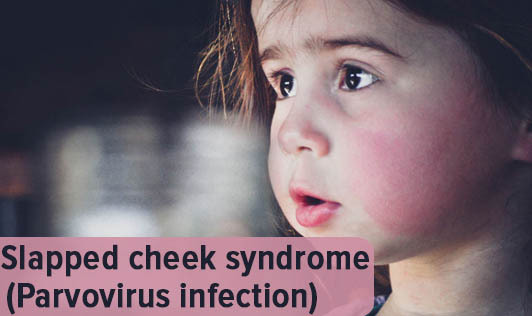 This is also known as fifth disease or erythema infectiosum, a type of viral infection that is common in children although it can affect anyone of any age. It results from being infected with human parvovirus B19, characterized by a rash. It is highly contagious, just like a cold, often through respiratory secretions and hand to hand contact. The symptoms vary greatly depending on the age of the person who has this condition. The rash may extend to the arms, thighs, trunk, buttocks where the rash has a lacy, pink, slightly raised appearance. Adults don't usually develop a slapped cheek rash. Instead, the most obvious symptom of parvovirus infection is joint soreness lasting from a few days to weeks. Commonly affected joints are hands, ankles and knees. Parvovirus infection during pregnancy sometimes affects the red blood cells in the foetus causing severe anemia which could lead to miscarriage or stillbirth. The fetal risk appears greatest during the first half of the pregnancy. The treatment includes a blood transfusion directly to the foetus or giving the mother medications that pass through the placenta to the foetus. Parvovirus infection in people with a weakened immune system due to severe asthma or those being treated for cancer, HIV/AIDS can develop into chronic anemia. Contact your doctor immediately if you or your child has symptoms of this condition to avoid any complications!